Three thirsty towels for drying big SUVS, small cars, and everything in between! Towels are like money – you can never have enough! As many detailers will tell you, the best way to completely dry your vehicle is to go over it once with a large towel to remove the majority of water. Then go over it again with a smaller towel to catch any excess water around the mirrors and handles. If you’re really on the ball, you use a third towel to wipe down your door jambs or to give your windows special attention to prevent streaks. The Guzzler Triple Kit allows you to dry however you want with three thirsty towels that are super safe on all your vehicle’s surfaces. Each towel features a satin edge and a plush 80/20 blend of polyester and polyamide. The Guzzler is a soft, plush waffle weave towel with a strip of silky soft satin sewn around the edges to cover the exposed stitching. The towel can absorb 7 times its own weight in water! In fact, this towel is 20% plusher than our original waffle weave towels to give it even an even greater capacity for moisture! It will not scratch any surface and it has a magnetic charge that attracts lint and dirt. This towel will leave the inside and the outside of your vehicle spotless! The Supreme Guzzler is 20% thicker than the original towel to give it an even greater capacity for moisture. 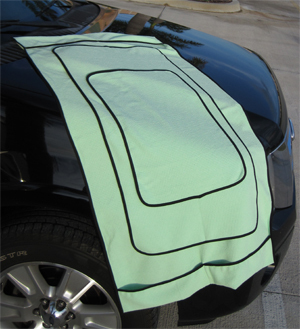 At approximately 5.5 square feet, this waffle weave towel can dry most small cars without being rung out once! As if that weren’t enough, the towel now has a silky satin edge all the way around! The satin edge covers the exposed stitching to eliminate any risk of the thread scratching the paint. This towel is the solution to drying big SUVs, vans, and trucks. The towel is folded over at the ends and stitched to make four pockets. Whether you’re holding the towel horizontally or vertically, you can put your hands in the pockets and spread it out to its full width. You’ll cover more ground in a single pass, and you won’t drop the towel because you’re wearing it on your hands! The Guzzler Triple Kit is a great addition to your towel collection! Use the Ultimate Guzzler to wipe away almost all the water from your vehicle; then follow up with the smaller towels to dry and buff specific areas, like the windows. Microfiber will never cause streaks or deposit lint, and with the satin edge, it will never scratch! A total retail value of $70.97. Save $10.98! Hands down best drying towel on the market, they are high quality towels. Before I used $10 towels which gave out after few washes, these dry very well, leave the paint surface nice, and are very high quality which will last a long time. ConsPrice, but you pay what you get for, spend a little more and dont look back ever again. Buy this product you won't be sorry !!!! I ordered the Cobra guzzler triple kit. Fantastic product !!!! I dried my wife's entire Honda pilot with the large drying cloth, didn't even have to ring it out. It's very absorbent and didn't leave any streaks even on the windows. A little pricey, but by far the best drying cloth I have ever used. It definitely out performed any chamois or other microfiber cloths that I have used.